테러지원국 명단에 마땅히 들어가야 할 나라가 있다면 북한이다. 북한은 1983년 10월 버마의 수도 랭군에서 당시 버마를 방문 중인 전두환 한국 대통령을 겨냥해 폭탄테러를 자행, 17명의 한국인들과 4명의 버마인을 죽였다. 1987년에는 인도양 상공에서 대한항공기를 폭파시켜 탑승했던 115명 전원을 죽였고 2010년 한국 해군 초계함인 천안함을 어뢰로 폭침시켜 46명의 해군을 죽였으며 8개월 뒤에는 연평도를 폭격해 2명의 한국 해병과 2명의 한국 민간인을 죽였다. 이처럼 북한이 저지른 테러 전과를 보면 북한은 영원히 테러지원국 명단에 있어야 했다. 북한이 저지른 테러 중 일부는 2008년 조지 W. 부시 대통령이 재임 말기 북한을 테러지원국 명단에서 삭제한 전후에 자행되었다. 북한을 “악의 축”에 포함시켜 유명했던 부시 대통령은 콘돌리자 라이스 국무장관의 충고에 따라 크리스토퍼 힐 미국 북핵 대표와 김계관 북한 외무성 부상이 끝없어 보이는 회담을 통해 타결한 협정을 북한이 지킬 것이라는 이론 하에 북한을 테러지원국 명단에서 삭제하는 우를 범했다. 힐 대표는 북한 사람들은 흥정한 것을 지킨다는 전제 하에 복잡한 핵협정 스케줄을 지킬 것이라고 라이스 장관을 설득했다. 힐은 더 잘 알았어야 했는데 그렇지 못했다. 지금 그는 김계관이 자신에게 거짓말을 했고 약속을 지키지 않았으며 자신을 속였다고 말하고 있다. 그때 힐은 무슨 생각이었을까? 북한 지도자들이 언제부터 약속을 지켰던가? 그는 북한이 1950년 6월 한국을 침공한 이후 계속 속이고 배반해온 오랜 역사를 몰랐단 말인가? 힐은 북한이 어떤 것도 합의하지도 않았는데 북한은행계좌를 동결시킨 마카오 소재 방코델타아시아 은행에 대한 미 재무부의 제재를 완화하도록 했다. 그것은 정말 멍청한 짓이었다. 북한은 오랫동안 자신들이 위조한 100달러 지폐와 마약과 북한에 제작한 담배와 다른 제품을 허위 외국브랜드로 속여 전세계에 팔아 번 돈을 세탁하는 데 방코델타아시아 은행을 이용했다. 미국은 이 방코델타아시아 은행을 북한이 사용하지 못하도록 하면서 북한을 코너에 몰아넣었다. 당시 북한 협상자들은 북한을 테러지원국 명단에 넣는 것 못지않게 방코델타아시아 은행을 사용하지 못하도록 한 것을 두고 아우성이었다. 도널드 트럼프 대통령이 북한이 당연히 있어야 할 테러지원국 명단에 다시 집어넣은 것은 실수를 만회한 것이다. 부시와 트럼프 대통령 사이에 있던 버락 오바마는 백악관에서 8년 동안 있으면서 북한에 대해 아무것도 한 것이 없다. 그의 이른바 ‘전략적 인내’ 정책은 보통 의사들이 환자를 수술하기 전에 병의 경과가 어떤지를 지켜보자고 할 때 쓰는 용어로 ‘주의 깊게 기다린다’는 의미다. 트럼프는 “전략적 인내”는 끝났고 이제는 결단력 있게 행동할 것이라고 반복해서 말해왔다. 북한을 이란, 시리아, 수단과 같은 불량 정권의 명단인 테러지원국에 다시 넣은 트럼프의 결정은 미국 정책의 변화를 보여준다. 트럼프가 북한을 테러지원국 명단에 다시 넣을 만한 이유는 충분하다. 김정은의 이복형제인 김정남이 지난 2월 쿠알라룸푸르 국제공항에서 어리석은 윤락녀들이 자신의 얼굴에 문지른 VX 신경가스로 살해당한 것을 보면 북한은 34년 전 랭군 폭파테러 만행으로부터 배운 것이 하나도 없다는 것을 보여준다. 김정은은 아버지 김정일, 할아버지 김일성처럼 어떤 처벌도 받지 않고 자기가 하고 싶은 대로 해외에서 살인을 명령할 준비가 되었다. 암살의 실제 범인들로 그 여성들에게 리얼리 TV 쇼에서 연기를 하는 것이라고 속였던 4명의 북한 사람들은 도망쳤지만 이를 통해 북한은 테러 국가라는 것이 다시금 드러났다. 어리석게도 호텔에서 북한 깃발을 훔쳐려 했던 미국 대학생 오터 웜비어의 사망은 북한은 테러국가라는 이미지를 분명히 했다. 의식불명인 채 오하이오 신시내티에 있는 부모에게 돌아온 웜비어는 북한에 억류되었던 17개월 동안 심한 고문을 받은 것이 분명하다. 하지만 북한을 테러지원국 명단에 다시 집어넣었다고 무슨 큰 차이가 있겠는가? 김정은이 이를 통해 정신 차리고 자신의 정책들을 바꾸고 테러 위협 대신 미국, 한국과 관계를 개선하는 계기가 될까? 북한 정치선전 창구는 트럼프에 대해 일상적인 공격으로 대응하고 있다. 트럼프가 이 달 한국 국회에서 북한 정권이 외국 뿐 아니라 북한 주민들에게 얼마나 잔인한지 공격한 이후 북한의 욕설은 더 심해지고 있다. 북한을 테러지원국 명단에 다시 넣으면서 트럼프는 분명한 신호를 보내고 있다. 미국은 김정은이 미국 본토까지 날아올 수 있는 미사일 혹은 동아시아 지역 내 미군기지를 사정거리에 두고 있는 중거리 미사일에 핵탄두를 실을 경우 북한에 단호하고 강력하며 파괴적으로 대응할 것이라는 것이다. 북한을 테러지원국 명단에 다시 넣은 것은 트럼프가 중국을 위시해 동아시아 강대국들의 힘을 모아 북한이 지역 전쟁의 위험을 무릅쓰기보다 북한의 핵과 미사일을 포기하는 타협을 하도록 압력을 넣도록 하면서 자신의 정책들의 확고함을 보여주려는 것이다. If any country deserves to be on a list of nations sponsoring terrorism, it should be North Korea. The record of North Korean terrorist acts ranging from the murder of 17 South Koreans and four Burmese, killed by a bomb intended for the visiting Korean president, Chun Doo-hwan, in the Burmese capital of Rangoon in October 1983, should have earned the North a permanent place on the list. Then came the bombing in November 1987 of a Korean Air flight over the Indian Ocean, killing all 115 aboard, the sinking by torpedo of the South Korean navy corvette the Cheonan in March 2010, killing 46 sailors, and eight months later the shelling of Yeonpyeong Island, killing two South Korean marines and two civilian workers. Those are but a few of the many offenses of which North Korea is guilty, before and after the decision by George W. Bush in 2008, near the end of his second term as president, to remove North Korea from the list. Bush, who had famously included North Korea in an "axis of evil" had fallen for the advice of his secretary of state, Condoleezza Rice, to scratch off North Korea on the theory that the North would abide by agreements hammered out by the diplomat, Christopher Hill, in seemingly endless negotiations with a North Korean team led by Kim Kye-gwan, vice foreign minister. Hill convinced Rice that the North would abide by a complicated schedule under which the North Koreans would surely live up to the bargain. Hill, of course, should have known better. He now says that Kim Kye-gwan lied to him, broke promises, misled him. What was Hill thinking? Since when did North Korean leaders keep their word? Did he not have any comprehension of the long record of North Korean deceit and betrayal beginning with the invasion of South Korea in June 1950? Hill before getting the North to agree to anything had to get the U.S. Treasury Department to relax constraints on an obscure bank in Macao, Banco Delta Asia, that had frozen North Korean bank accounts. That was also stupid. The U.S. had the North Koreans in a corner, unable to use BDA as they had for years as a conduit for counterfeit hundred-dollar-bills and cash "earned" from the sale of narcotics and arms along with cigarettes and other products made in the North and sold worldwide under false foreign labeling. North Korean negotiators screamed about the BDA blackout about as much as they did about the "terrorist" listing. President Donald Trump, in restoring North Korea to its rightful place on the list, was basically undoing a mistake. In between the Bush and Trump presidencies, Barack Obama, in his eight years in the White House, had essentially done nothing about North Korea. His policy of "strategic patience" did have its merits as a rationalization for "watchful waiting" the term that doctors use when they recommend seeing how or if an illness progresses before operating on the patient. Trump has said repeatedly he was done with "strategic patience" and now would act decisively. His decision to put North Korea where it belongs, on a list of rogue regimes that includes Iran, Syria and Sudan, symbolized the shifting U.S. policy. Trump had plenty of good reasons for acting as he did. The murder of Kim Jong-un's half-brother, Kim Jong-nam, last February by VX gas smeared on his face by a couple of silly prostitutes in Kuala Lumpur's international airport showed North Korea had learned nothing from the Rangoon bombing 34 years earlier. Kim Jong-nam, like his father, Kim Jong-il, and his grandfather, Kim Il-sung, was ready to order a murder overseas thinking he could get away with the crime. The real perpetrators, four North Koreans seen at the airport, who had convinced the ladies they were performing a stunt for a reality TV show, got away, but North Korea was again exposed as a terrorist state. The death of Otto Warmbier, the American university student who had foolishly tried to pilfer a banner from his hotel, confirmed the impression. Obviously Warmbier, unconscious when returned to his parents in Cincinnati, Ohio, had been severely tortured during 17 months in captivity. But so what if North Korea is back on the list as a "sponsor of terrorism"? What difference will it make? 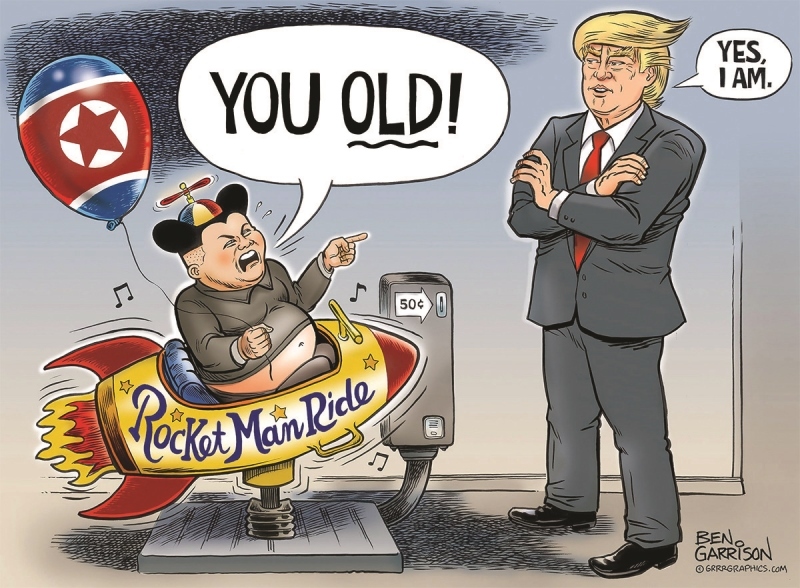 Is there any chance Kim Jong-un will awake to the reality that he would do well to mind his manners, change his policies and try to get along with the U.S. and South Korea rather than engage in terrorist threats? The North Korean propaganda machine has responded with the usual attacks against Trump. The invective has worsened since Trump's speech to South Korea's National Assembly this month at which he attacked the regime for cruelty to its own people as well as offenses on foreign soil. By placing North Korea back on the terrorist list, Trump essentially was sending a signal. The U.S. would act decisively, strongly and destructively, against North Korea if Kim dared mount a warhead on a missile capable of reaching the U.S. or on a mid-range missile within range of U.S. bases in the region. Listing North Korea as a terrorist state suggests the firmness of Trump's policies as he tries to whip up support among powerful nearby nations, notably China, for pressuring North Korea to come to terms on its nukes and missiles rather than risk a regional war.